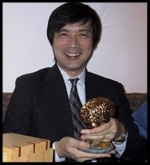 Japanese neurobiologist Atsushi Iriki won the 2004 Golden Brain Award from the Berkeley-based Minerva Foundation for seminal work showing how the brain connects vision and the sensation of touch. Iriki received his award at a private ceremony on October 25th, in San Diego, where he was attending the annual meeting of the Society for Neuroscience. Iriki is professor of cognitive neurobiology at the Tokyo Medical and Dental University and head of the Laboratory for Symbolic Cognitive Development at Japan’s RIKEN Brain Science Institute. More recently, Iriki and his colleagues showed that brain cells respond in the same way to the image of the body in a video monitor during tool use, coding this image as an extension of the self. In both studies, Iriki and colleagues successfully trained macaque monkeys to do things the monkeys were not believed capable of doing. To learn how the brain connects visual and tactile information during tool use, the scientists trained monkeys to use a tool (a rake to gather food pellets). For the video image study, Iriki’s research team trained monkeys to recognize their body image when using a tool in a video monitor. Iriki believes his work has implications for understanding the evolution and, perhaps, the possible future development of human intelligence and modern technology.